We released PowerCLI 6.5.1 two weeks ago and the response has been incredible! The VMware.PowerCLI module is closing in on 4,000 downloads from the PowerShell Gallery and we’ve received a ton of good feedback. There seems to be quite a few questions and comments over this new installation method so I created a walkthrough video to illustrate the process for PowerShell version 5.0 as well as for versions 3.0 and 4.0. We’ve also collected the most common errors and issues during the installation process and included troubleshooting steps for those below. 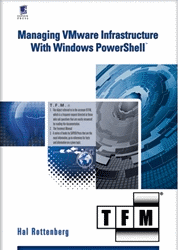 Ensure previous versions of PowerCLI are uninstalled and all PowerShell sessions are closed. Verify the file isn’t being blocked by an antivirus software. A command with name ‘verb-noun’ is already available on this system. This is due to a module already available on the system containing that cmdlet. The more common example modules include FailoverClusters and HyperV. Append “-AllowClobber” to the Install-Module command line. This could be due to a lack of connectivity to the PowerShell Gallery. If a proxy can be used, the “Install-Module” cmdlet can configure proxy connectivity with the “Proxy” and “ProxyCredential” parameters. This warning is just indicating there is an issue establishing connectivity to the PowerShell Gallery. Retry the installation at a later point in time and it should succeed. We are really excited about this release and what this means for the future of PowerCLI! Upgrade to PowerCLI 6.5.1 today, and keep that feedback rolling in! This entry was posted in General and tagged PowerCLI, PowerShell on May 4, 2017 by Kyle Ruddy. At the moment there is no offline install, or at least that what it looks like. You can download the 6.5 Release 1 version from your my.vmware.com under any vSphere product via the Drivers and Tools Tab. I was able to work around the offline install failure by copying the “C:\Program Files\WindowsPowerShell\Modules\VMware. *” folders from a machine that updated successfully. really thanks for the installation video. Definitely helped cleared up some technical misunderstanding on my part. great video . I have successfully installed powerCLI 6.5.1 . Thanks for sharing with us . WARNING: Package ‘VMware.VimAutomation.Core’ failed to download. PackageManagement\Install-Package : Dependent Package ‘VMware.VimAutomation.Core’ failed to install. Connect-VIServer : Could not load file or assembly ‘VMware.VimAutomation.Logging.SoapInterceptor, Version=1.0.0.646, Culture=neutral, PublicKeyToken=null’ or one of its dependencies. The system cannot find the file specified. There isnt alot to find by google with that error. Hi Oli. I was getting the same issue.. Until I remembered I needed to go to the control panel and uninstall the previous old vmware powercli that was installed using the old traditional setup.exe.. this resolved the error I was getting which is the exact same error your seeing on connecting to a vcenter. Received a Microsoft Visual C++ Runtime Library runtime error R6034 when attempting to install the vmware.powercli module. Try the ‘install-module -name vmware.powercli -scope currentuser’ command again. It seems vmware is highly committed to this decision. Any complaints are met with “But the new way is better!”. Working in a disconnected, highly secure DoD environment makes this a no go for us. I shouldn’t have to try to find a way around security or download on my home computer to get my updates. Please swallow your pride and offer an msi in addition to the Gallery. Can you expand on what you’re suffering with? With PowerCLI versions 6.5.1 and newer, the PowerCLI installation process was turning into a PowerShell one-liner. It doesn’t get much easier than that! To bad the article itself does not clearly mention that one-liner 🙁 although there is some info in the Common Troubleshooting Steps. Why would you need a video to explain a PowerShell one-liner, and why is that video no longer there ? Hello, I can install and list all modules when I run with an elevated powershell users, but nothing when I run with a normal account. I tried to change the scope to allusers but nothing. What am I missing? I haven’t been able to reproduce this, but you’re not the only one that has run into this issue. By any chance, have you tired ‘Install-Module -Name VMware.PowerCLI -Scope AllUsers -Force’ ? Perhaps the force parameter will kick things back into an operational manner for all users. This is frustrating – I can’t get it to install. WARNING: Unable to resolve package source ‘https://www.powershellgallery.com/api/v2/’.PackageManagement\Install-Package : No match was found for the specified search criteria and module name ‘VMware.PowerCLI’. Try Get-PSRepository to see all available registered module repositories. WARNING: Unable to resolve package source ‘https://www.powershellgallery.com/api/v2/’.PackageManagement\Find-Package : No match was found for the specified search criteria and module name ‘VMware.PowerCLI’. Try Get-PSRepository to see all available registered module repositories. I’ve fixed my issue. I have a custom PS profile and environment variables. I was able to get this working by saving the VMware.PowerCLI packages locally, then copying the extracted folders underneath several of the $ENV:PSModulePath folders. I had three of them specified and as such, I copied three sets of the extracted folders. The little mention of AllUsers Module folder location pointed me to C:\Windows\System32\WindowsPowerShell\v1.0\Modules. After that, I was able to install and import. On my other machine without customized PS profiles and locations, just using Microsoft’s default – the module installed fine from the repo. Thanks for this, Kyle- super-helpful. Hoe do i get more details about this? Thank you Kyle, great tips, very helpfull for me, i’m waiting for another great post from you. hanks for every one of your effort on this web site. Betty really likes doing research and it is easy to see why. We know all concerning the dynamic medium you offer rewarding steps via the web site and in addition welcome response from the others on this article and my girl is in fact being taught so much. Enjoy the remaining portion of the new year. You’re the one carrying out a glorious job. togel online saat ini menjadi salah satu judi online yang paling diminati di indonesia. Salah satu yang memberikan dampak bagi perkembangan togel online adalah dengan hadirnya beberapa pasaran togel besar dunia seperti togel sgp, togel hk dan togel sidney. Pengeluaran togel pun menjadi informasi yang paling sering dicari oleh para pecinta togel online di indonesia. cool is very useful once dude information, I’m hoping for the same high-grade content by you later. Your article has truly peaked my interest. I will bookmark. Kini semua orang sudah bisa memainkan poker online uang asli melalui link alternatif dewa poker Indonesia, yang dimana kami menyediakan permainan poker online yang terbaik di indonesia.